I'm nestling back into our cozy old farmhouse. Yesterday, in between sledding and eating bowls of snow drizzled with maple syrup, we cleared out almost all signs of the holidays. No matter how many times I swept, I still kept finding hidden pine needles! I love the feeling of a clean slate . Out with the old and in with the new! My thoughts for January are all about clearing clutter and feathering our nest with elements from outdoors and a couple of new (to me) items. This little corner is coming along nicely. 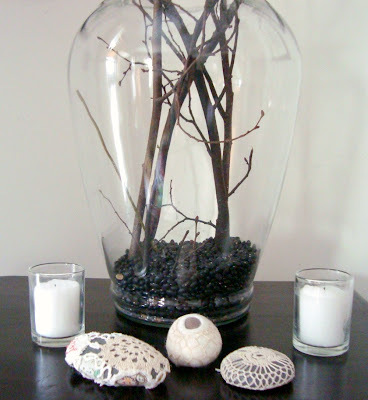 A giant glass vase (from a summer garage sale) is filled with fallen branches. 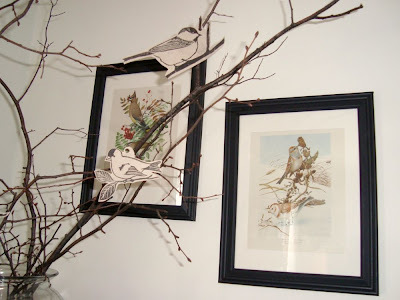 I printed some of my birds onto recycled card stock (boxes, etc.) and punched a hole in the top. After packing away all of our Christmas ornaments, it was fun to have a new "tree" to decorate. 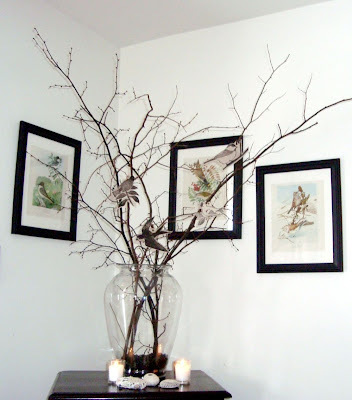 Behind the delicate branches peeks the three vintage bird prints I found last fall. I frame 99% of my pictures and photos in black. It keeps things unified throughout my house, which is filled with such a hodgepodge of used and handmade furniture and decor. Because we have SO much exposed wood in our downstairs, I've always preferred the walls to be simple and white. Yes, those are black beans at the bottom of the vase... I threw in a handful to steady the branches. This corner is in the midst of our living room... which sees a lot of action. It's feeling very peaceful and meditative, especially with candlelight and my collection of covered stones from Resurrection Fern. Ahh... come on in 2010, I'm ready. Happy new year maya - I'm looking forward to following all your art this year. I love this! I have some nesting happening on my mantel. It is such a lovely aesthetic to bring nature inside. A clean slate and a tidy , calming corner sounds delightful. I'm slowly working my way around the house decluttering and it feels so good. ooh, i love this corner!! your birds are so lovely. Lovely, makes me think that Spring is just around the corner - goodbye winter! I like the black beans! So much cheaper than glass or "polished river stone" and just as pretty. I'll have to remember that one. your nest is fresh...filled with lovely! Beautiful corner! I love it! I just wanted to say "thank you" for all the love and beauty you offer on your blog. this is so lovely...very peaceful! I had just placed a nest under an old glass cloche..we all must be nesting! !